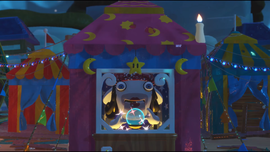 Madame Bwahstrella is a minor character in Mario + Rabbids Kingdom Battle. She is an animatronic Rabbid-like fortune teller who resides in Spooky Trails. When Mario and co. first encounter her, she informs them of their "doom". Beep-0 initially refuses to believe her due to his disbelief of superstition, but Bwahstrella insists she is correct. The group then leaves her behind to resume their search for the Relics of Goodness. This page was last edited on November 12, 2017, at 23:02.